A friend of mine asked if I could make her a Pascal, the chameleon from the movie ‘Tangled’. I’d seen the movie as well and I simply loved his character. Animal sidekicks are always awesome, but there was something about his look that made me fall in love with him as soon as he came into view. The feet are the wrong shape and Pascal really has to be able to stand up straight. Plus, his face has so much expression to it. It was going to be hard to recreate this in crochet form. But I was willing to try either way. Sadly, I only wrote down about half of the pattern I made. Maybe once I get better at making patterns and writing them down, I will redo him and make a full pattern. There are some things that I would like to change about him. Like the tail, I believe I made it too short. The face has a weird expression to it. And some of the details could have been better, but then again, I haven’t been into making my own patterns for very long. So for now, you will have to make do with just the pictures. Enjoy! I stuffed his tail slightly and placed a pipecleaner in it, so you can bend and unbend it all you want. I have to admit that in my youth, I had loads of ponies and a stable for them to live in, but then again, didn’t every little girl? Nowadays, I’m not into the whole “MLP: friendship is magic” and all that. So when I first came upon the My Little Pony pattern from Hooked on Anime, I didn’t really feel the need to make myself a pony. But when a friend of mine asked me if I could make her one, I knew just where to turn. The pattern is pretty easy to follow, once I got the hang of using double crochets (or treble crochets if you’re from the UK) instead of single ones. Also, the unfolded wings can be a little hard to do, but thankfully, the pattern also provides for folded wings. This was a really fun project for me, because I had to learn a few new techniques. I had never really given an amigurumi hair before. Well, once, with the Christmas set, I gave the angel some blonde hairs, but it didn’t really look right. Luckily for me, the pattern comes with some links to how you can make the hair. And that’s how I learned the loom-technique. It’s pretty easy to do once you get the hang of it. I used a thick piece of cardboard instead of a lace loom though, but it worked out pretty well. I think using a real loom would be a bit easier though, but then again, I’ve never used one in real life, so I can’t say for sure. Then there were the eyes. They’re pretty detailed, so the usual black safety eyes were useless. I had to find another way. For Fluttershy, I made the eyes using bits of felt, which came out ok for one eye, but the other looks totally evil (luckily, the mane covers that one). It was also quite a hassle to glue together all the tiny pieces. For Rainbow Dash, I decided I needed another technique. I found some white iron-on cloth, the stuff that’s used to repair tears in clothing and such and figured I would be able to use that. I got the outline of the eyes onto the iron-on cloth by finding a picture online on our Ipad (the thing had to come in handy sometime), putting the cloth onto it and carefully trace the eye with a pen. Then I ironed it on and coloured the eye with acrylic paint. It came out looking pretty good, if I may say so myself. The same goes for the cutie marks. The one from Fluttershy I made with felt, which made for a bit of a mess and some fiddling to get it right. Rainbow Dash’s was easier with the cloth and paint. The wings were also fun to figure out. The unfolded version can be a bit difficult at first, but once you get the hang of it, it isn’t too much trouble anymore. For Fluttershy, I made two sets of wings, one folded, one unfolded and attached buttons on them so they are interchangeable. Rainbow Dash just got the unfolded version, cause she doesn’t strike me as the kind of pony who would fold her wings for very long (if I have to believe the internet, which I usually do). Once again, my work came out a bit smaller than the pattern suggests, but then again, I’m used to pretty small hooks. Rainbow Dash came out bigger than Fluttershy because I used a 3,5mm hook on her and made Fluttershy with a 2,5mm. It’s pretty cool to see just how much influence hooksize can have on your work. They do take up quite a bit of yarn, Rainbow Dash a bit more than her friend. Eventually, I ran out of blue while working on the last leg. That’s how I learned to always get more yarn than you think you’re going to need, because man, was it ever a problem to find the same colour again. I actually had the same problem once while working on a Companion Cube from the game Portal, but this time, I really learned my lesson. All in all, this was another crazy fun pattern to work with and I hope many more ponies will be made using it. Maybe, one day, when I really run out of projects, I might make the full set… But for now, my friend will have to make do with these two. A little while back I watched the movie ‘Despicable me’ for the twentieth time (it could also have been the third time, I’m not entirely sure…) and suddenly it struck me: I haven’t even made a minion yet! Luckily, a pattern was quickly found and I set to work. The project did have to be put on the backburner for a while, due to holidays, work and other things that got in the way, but shortly after New Year, I was able to finish this little guy. You can find the pattern here. And a step-by-step guide to putting him together here. The pattern wasn’t the easiest I’ve ever followed, so I don’t recommend it when you’re just starting. But if you are a little more experienced, it’s a great project! I noticed too late that I’d made a couple mistakes, mostly with the eyes and mouth, but I really don’t want to redo them. The beauty of the minions is that they are all slightly different, so it isn’t a really big problem if it doesn’t come out exactly like the pictures with the pattern, right? Another thing I love about this pattern is that most parts are removable. You can take your minion apart! The patterns gives the straps real life button-holes, which I think is awesome and very clever! I had loads of fun making this little guy and I hope you guys will as well! And what kind of person would I be if I don’t share this pattern with the world? I do need to point out that this pattern can be a bit difficult. Especially the ears can be quite a pain to put together and I’m not sure if I explained it clearly enough. So as always, feel free to comment or contact me with any questions you have regarding the pattern. White yarn, yellow or gold yarn, black embroidery thread, pink felt, pink and red acrylic paint. The pattern is worked in rounds unless it says otherwise. You do not need to join rounds. Fo, leave a tail of yarn to close the hole and sew the head onto the body. Cut two small circles out of pink felt and glue or sew them onto the front of the face between round 9 and 12, roughly 5 stitches apart. Make the pupils either with two tiny circles of red felt or with a drop of red acrylic paint. Using black embroidery thread, embroider on the mouth. Fo, leave a tail of yarn to close the hole and weave in the ends. Sew the head onto the body between round 3 and 6. Make sure the face points forward. Fo, leaving a tail of yarn. Stuff the feet and sew them to the underside of the body. Finish stuffing and fo, leave a tail of yarn. Attach the tail between round 14 and 16 of the body. Fo, close up the hole and attach the yarn left of the earlobe. Fo, close up the hole and attach the yarn left of the second earlobe. Stuff this earlobe before you make the hole too small! With red acrylic paint or tiny circles of red felt, place a dot above the middle of each earlobe on both sides. Using pink acrylic paint, blush the ends of the lobes. Fo, leaving a tail of yarn to sew the ears to the head. Weave in the ends and slip the rings over part 1 of the ears before attaching them to the head. Attach part 1 of the ears to the sides of the head, between round 5 and 6. Sew part 2 of the ears above part 1, arching them slightly. Using pink acrylic paint, blush the insides of the ears. Note that Kyubey (and all other things related to Puella Magi Madoka Magica) is copyright of Aniplex. Please do not sell or publish this pattern as your own. If you do use it, please do give credit to me and link back to my site, thank you in advance! Being the ‘nerd’ that I am, I could not resist making a Mudkip. They’re probably some of the weirdest Pokémon out there, but there is something about that huge mindless grin that attracts me to them. This one came out small enough to function as a keychain. Simply attach a ball chain or keychain to the body or back of the head and this little guy is ready to travel the world with you. As usual, if you have any questions about this pattern, feel free to contact me or leave a comment. Dark blue yarn, light blue yarn, black embroidery thread, two 6mm black safety eyes, orange felt. Attach the safety eyes between round 4 and 5, roughly 5 stitches apart. fo, leave a tail of yarn to close the hole and sew the head to the body. Embroider the mouth over the line where the colours change. Cut two small circles out of orange felt and glue or sew them over the ends of the mouth (on the sides of the head). Cut the gills out of orange felt and glue them onto the circles. Feel free to use a little extra glue and make sure to press them on tightly. Flatten the piece and stitch the hole shut with 3sc. Fo and leave a tail of yarn to sew the crest tot the head. Sew the crest on top of the head. Fo, leaving a tail of yarn to sew the hole shut. Sew the head onto the body between round 1 and 4. The face should point straight ahead. 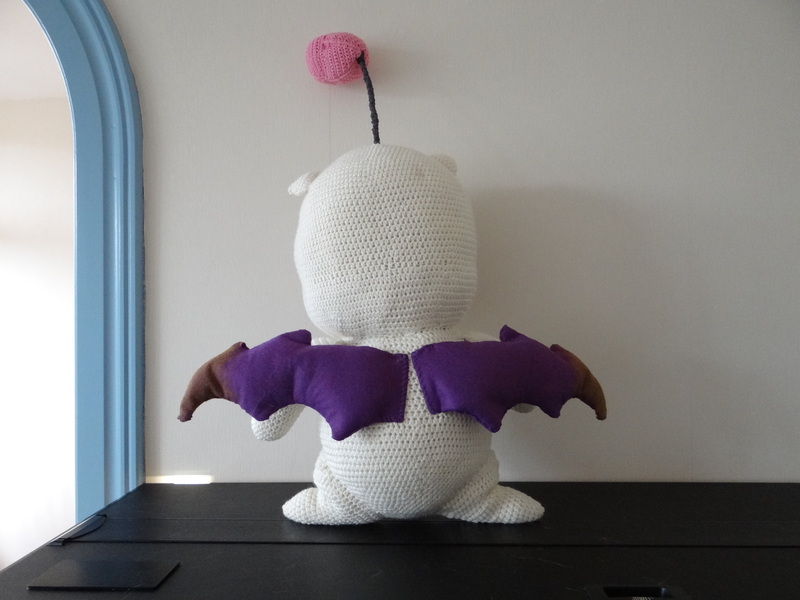 Fo, leave a tail of yarn to sew the belly to the underside of the body. Fo and leave a tail of yarn to sew the feet to the body. Stuff the feet lightly and attach them to the underside of the body. Flatten the piece and stitch the hole together with 3sc, fo leaving a tail of yarn and sew the tail vertically to the back of the body. Your very own Mudkip is all done and ready to go! Note that Mudkip and all other Pokémon are copyright of Nintendo. A wild pattern appeared! Lydia used ‘Crochet’. It’s super effective! Yes, another Pokémon pattern, simply because they are all so very lovely to make ^_^ I’ve got a few more up my sleeve, but for now, you’ll have to make due with Vulpix. If you have any questions about this pattern, feel free to contact me. Do note that I have slightly altered this pattern since I made my Vulpix, so if anything doesn’t come out quite like the picture, it’s because this one is based on the old pattern. The biggest changes are that the body is less fat (my Vulpix is a little chubby) and the hind legs have been altered to look more sleek. Fold your work flat and stitch together with 5sc. Fo and leave a tail of yarn for sewing the ears onto the head. fo, leaving a tail of yarn to sew onto the inside of the ears. Attach the safety nose between round 3 and 4.
fo, leaving a length of yarn to sew the hole shut and for sewing the head to the body. Cut two almond shaped eyes from black felt and two tiny half circles out of white felt. Glue the white pieces onto the black ones and glue an eye on each side of the head. See picture. Round1: 6sc in the second chain from the hook. Fo, leaving a long tail of yarn. Close up the hole, flatten the piece and roll it up tightly, sewing it together so it doesn’t unroll. The flat hair is worked in rows, so back and forth instead of in rounds. Sc all around the edges, so you get a nice clean edge, then fo, leaving a tail of yarn to sew the flat hair to the top of the head. Sew the hair on top of the head with the point of the triangle pointing towards the nose then attach the hair roll on top of the base of the triangle. Put together the ears and sew one on either side of the hair. fo, leave a tail of yarn to close the hole and sew the body to the head. Fasten the head onto the body, roughly between round 16 and 14. Stuff the leg, not too tight, flatten the piece and start working back and forth. Leave a long tail of yarn to attach the hind legs to the body. Fo, leaving a long tail of yarn to close the hole and sew the front legs to the body. Attach the front legs on the underside of the body, below the head and sew the hind legs to the sides of the body at the back. Stuff the tail slightly while working these rounds, but do not stuff all the way to the top! 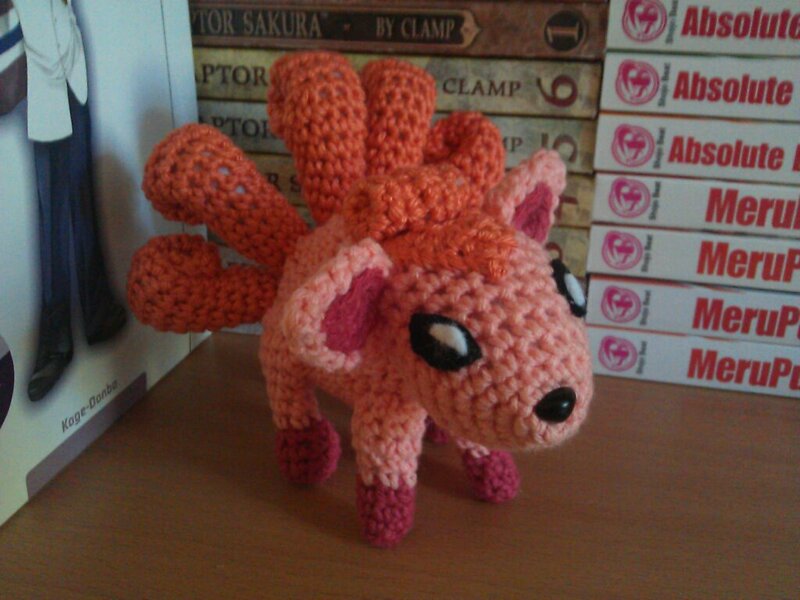 And there you have it, your very own little Vulpix! Note that Vulpix and all other Pokémon are copyright of Nintendo. Hello everyone and to everyone a happy new year! I hope the holidays went by without a hitch and that you all received some great gifts for Christmas, cause I know I have. At first when I was asked to make a wishlist for Christmas, I didn’t really know what to ask for. But then it hit me: I still needed some more pattern books! And so, for Christmas I got two amigurumi books that I’d been wanting for a while now, but didn’t get the chance to order myself: Amigurumi Toybox by Ana Paula Rimoli (who is amazing and you should check out her blog!) and Crobots by Nelly Pailloux. Crobots was a bit more of a gamble for me, since I’d only ever seen the cover. But as soon as I had this book in my hands, I just knew I had to make all of these cute little critters as soon as possible (no, I haven’t started yet..) They do require a bit more skill and a lot more details. I already fear the embroidering I’m going to have to do on them, but then again, it’s always good to learn new techniques. I am also going to need to search the house for any nails, screws, bolts and pretty much anything that looks techy. But I’m pretty sure we have a big bag over leftovers somewhere from when we put together our furniture (yay IKEA!). I also ordered a few mixes of coloured beads, bugle beads and sequins and am still looking for a perfect batch of mixed buttons. It may seem like a lot of trouble over a few crochet patterns, but I can assure you, they nééd these details. The pictures in the book look really cute and I kind of want to make the entire set all at once. But I do believe I need to pace myself here and calmly start with the first pattern in there. The great thing is that they’re sorted by difficulty, so you can start with the easiest one and work your way up to the more difficult patterns. Not only did I receive awesome gifts, I also got to give out a few. 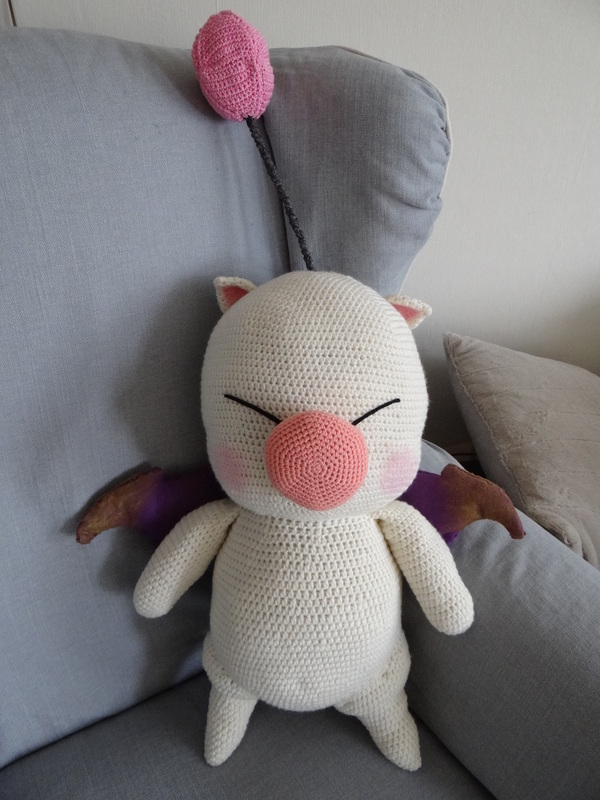 A while back, I gave you guys a glimpse into a work in progress: the giant Moogle head. Well, it isn’t just a head anymore! 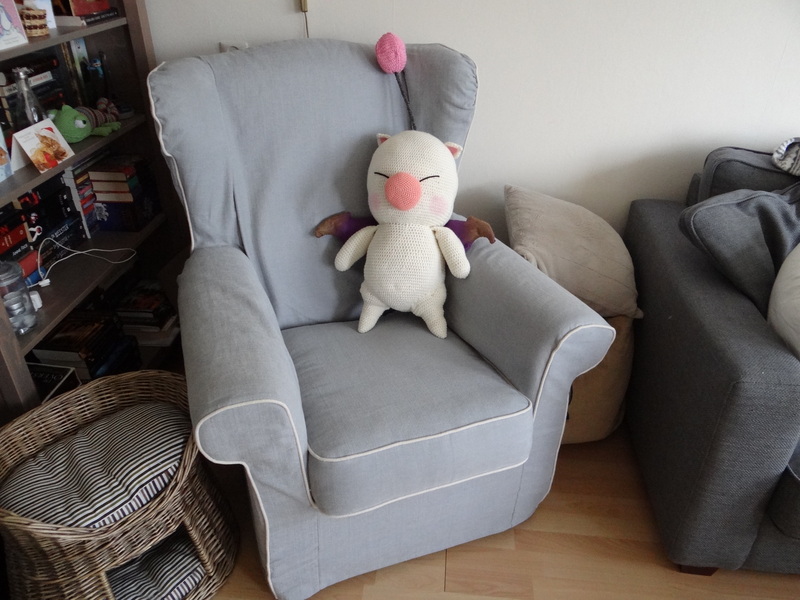 This guy was requested by my sister-in-law, who wanted a life-sized Moogle named Mog to go with her cosplay for one of the upcoming conventions in the Netherlands. 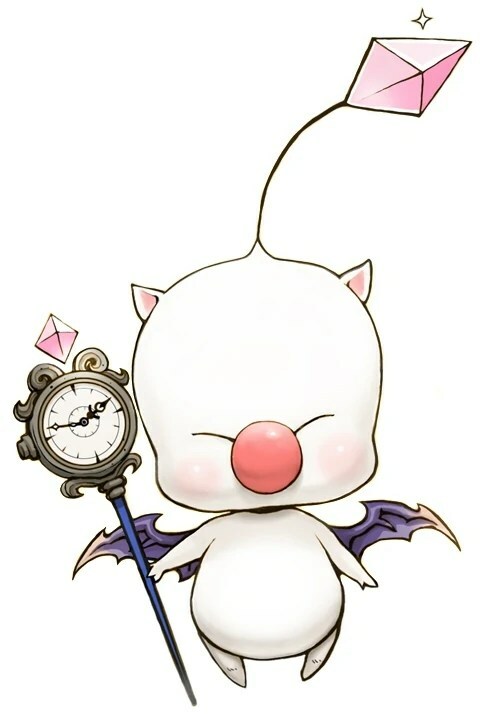 This is a creature from the video game Final Fantasy XIII-2. He was a lot of fun to figure out, but surely took a whole lot of work. I used about seven skeins of white yarn, half a skein of light pink yarn, half a skein of orangy pink yarn, one and a half bags of stuffing and four sheets of purple felt. The tips of the wings are a bit yellowish, which I tried to replicate by using acrylic paint. I finally managed to get the antenna to stand up by itself using about a mile of wire. I don’t really like the way that looked, but then again, I had no idea how to fix it otherwise. My sister-in-law loves it either way and we will get to see some action photos after the convention. Sadly, I did not write the pattern down as I went along, but maybe in the future, I’ll ask if I can borrow him back again and figure it out. – Write down patterns for everything that I work out myself. Looking back on what I’ve made so far made me realise that I let slip quite a few, which is a shame really, especially if I want to continue to fill this blog. – Never ever get fake nails again, even though they look awesome and I can still crochet with them. For new year, I thought it would be nice to get my nails done. About halfway through, it came to me that it might be very hard to crochet with these things. Luckily, I can still do it, but it isn’t as easy as it is with my own nails. I’m missing a lot of feeling on my fingertips and it’s pretty hard to pick at knots and stuff. – Share every pattern I make with the world. Which shouldn’t be too much of a problem, as long as my boyfriend lets me use the computer. He’s been hovering for a while now, so I believe it is time for me to wrap this up.